Multimedia endurance machine. 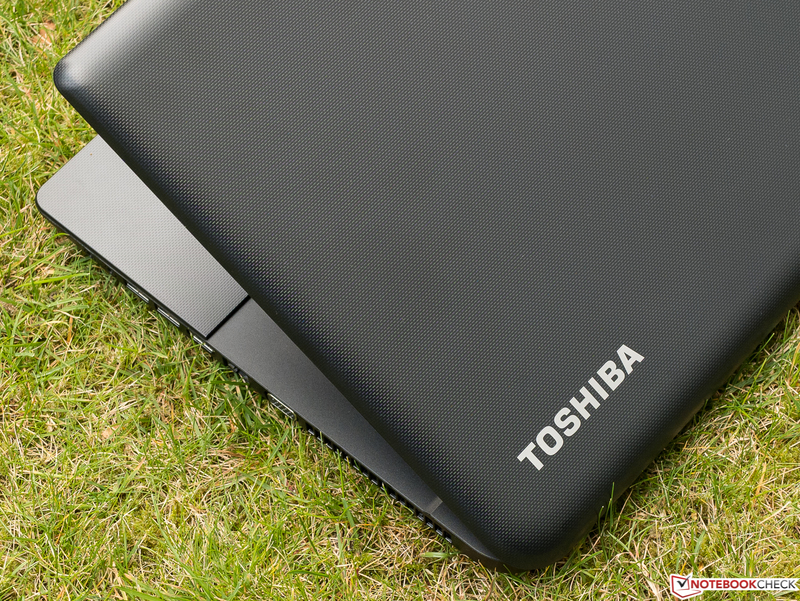 Technically Toshiba has done a great job with this laptop and its runtime endurance places it in the top rankings in the category comparison. Our in-depth report reveals whether the casing, input devices, screen, and general performance can match that. 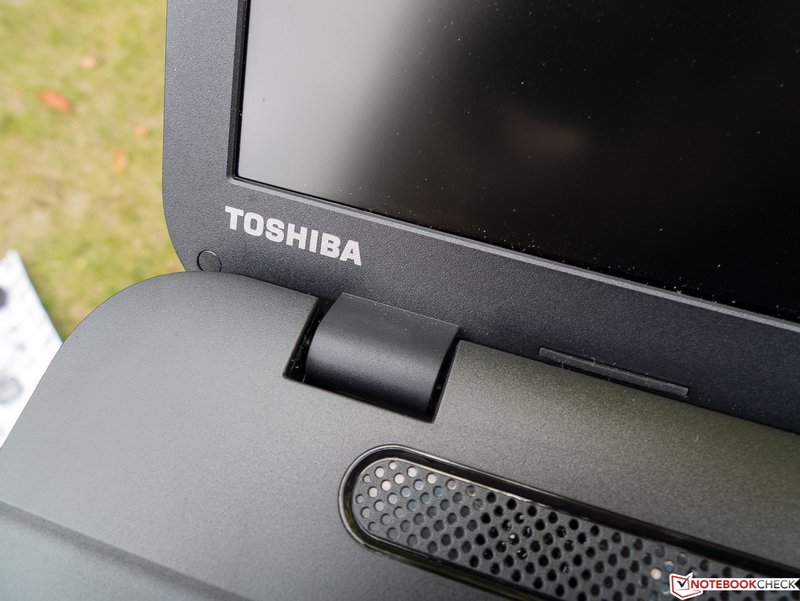 Since spring, Toshiba has introduced various new models of its Satellite Pro C70-B lineup to attract potential customers with affordable office laptop or desktop replacements. 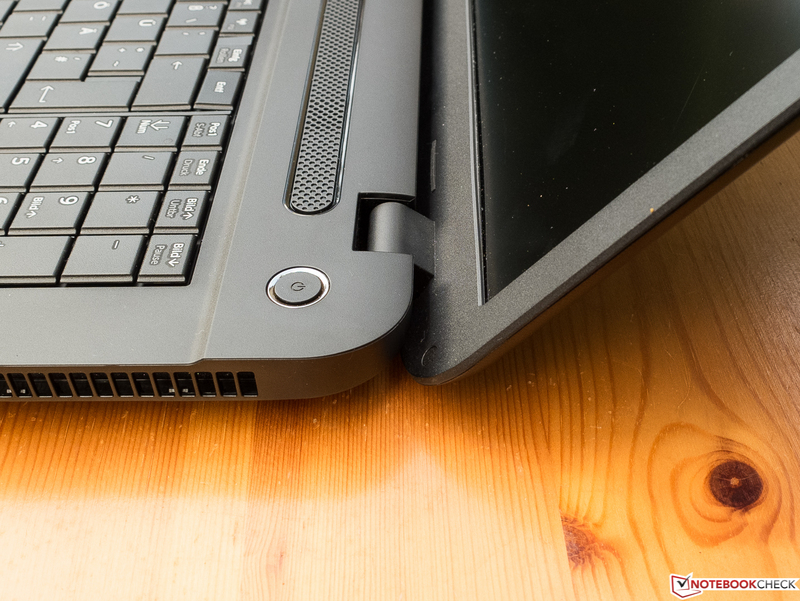 In a big German price comparison, no less than 15 different configurations were listed that have the same matte, 17.3-inch screen with a resolution of 1600x900 pixels, casing, and DVD burner in common. 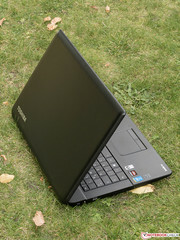 We will limit ourselves "only" on the eight models that are listed on Toshiba's website (German). Naturally, there are differences in the CPU, RAM configuration, graphics solution, storage devices, and operating systems. Three Intel processors from the current Haswell generation in the form of the Core i3-4005U, i5-4200U, and i5-4210U are available. Either the CPU integrated Intel HD 4400 GPUs, or as in the case of our review sample, a dedicated AMD Radeon R7 M260 takes care of graphic calculations. SSDs are not offered. The capacities of the installed conventional hard drives are either 750 GB or 1 TB. 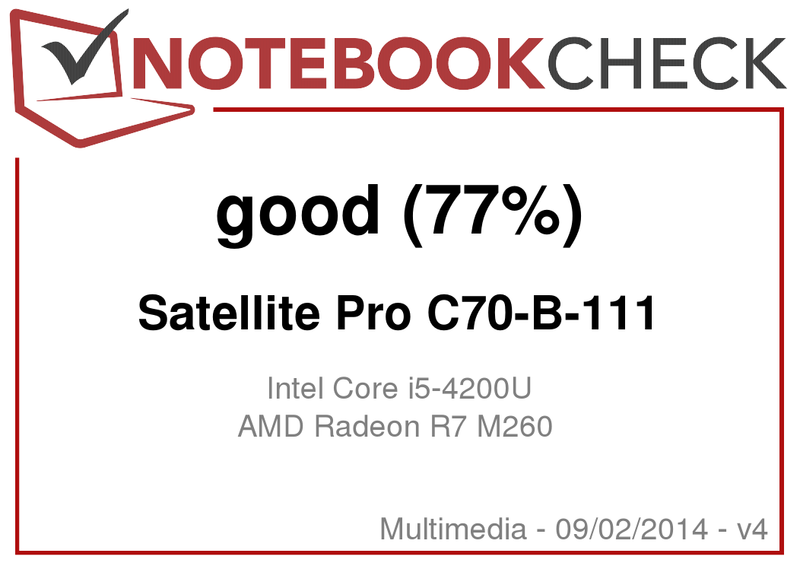 Furthermore, there is the Satellite C70 (D) - B lineup (German) (without "Pro") with some models that completely rely on AMD core components, such as the C70D-B-10E with an A4-5000 Kabini APU sold for as low as 500 Euros (~$648). The prices for the Pro versions range from 569 to 799 Euros (~$737 to ~$1035; RRP). Further details about the models can be found in the links provided under “Related Articles” on the right. 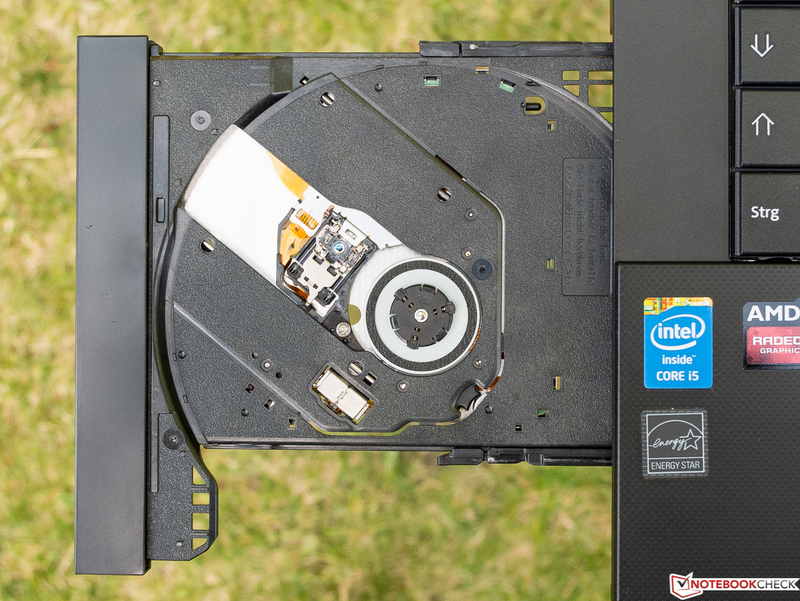 We selected two equally sized laptops for comparison in this test. Both feature a matte screen and are within the same price range as the C70-B-111. 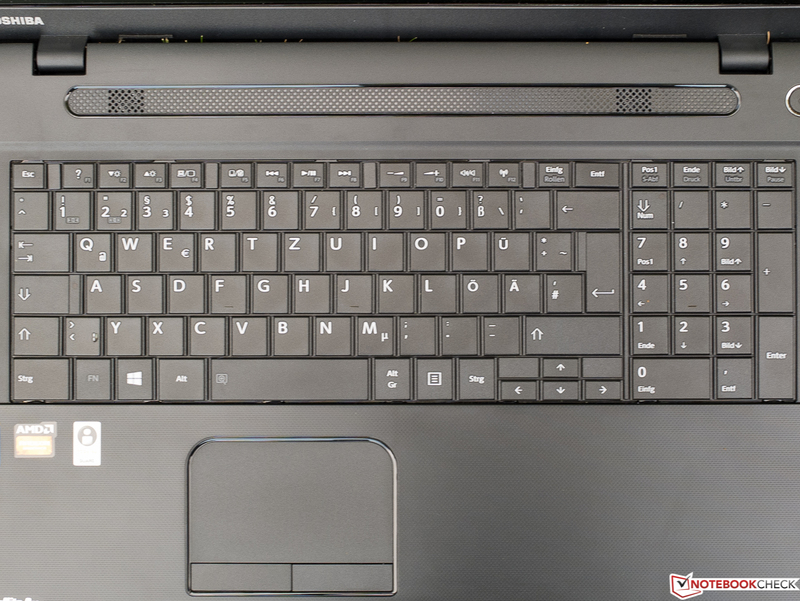 Acer's Aspire E1-772G 54208G1TMnsk (under 600 Euros; ~$777) is also equipped with a dedicated Nvidia's GeForce 820M graphics card as well as an Intel Core i5-4200M. The graphics card has to render a resolution of 1920x1080 pixels. It weighs half a kilogram (~1.1 lbs) more than our Toshiba at 3.2 kg (~7 lbs), and the Linux operating system is preinstalled . The HP ProBook 470 G1 E9Y75EA with Windows 7 / 8 Pro (DVD) weighing almost 2.9 kg (~6.4 lbs), has the same resolution as our review sample, currently priced under 650 Euros (~$830). 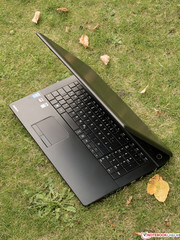 It is equipped with the same processor as Acer's device, but uses the older AMD Radeon HD 8750M graphics card. 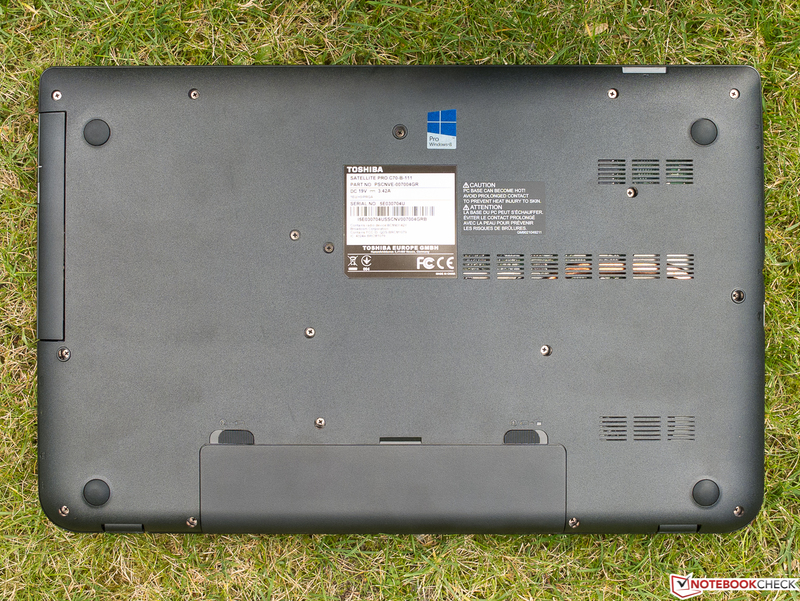 The reason why C70 laptops are sold at the starting price of only 500 Euros (~$648) is due to the black plastic casing. 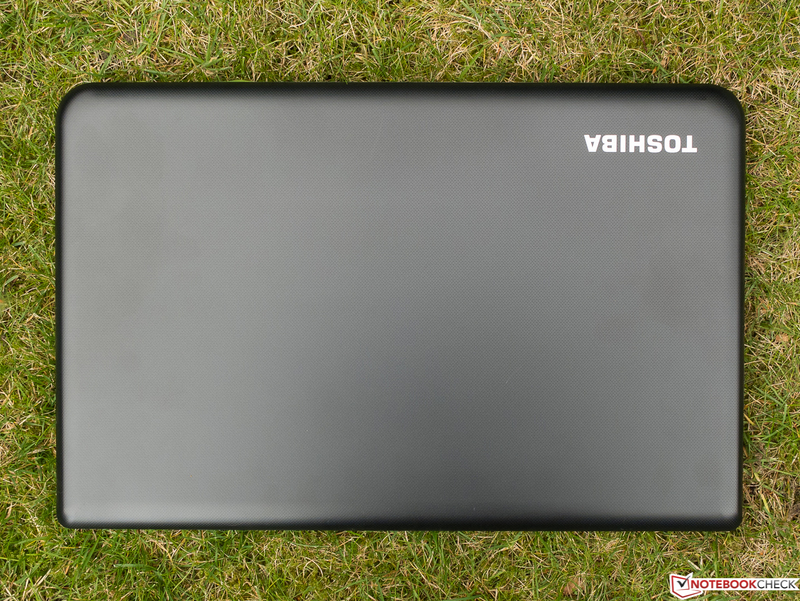 Toshiba did not even try to create an elegant impression, for example by using a brushed metal surface, but presents the laptop in stark simplicity. 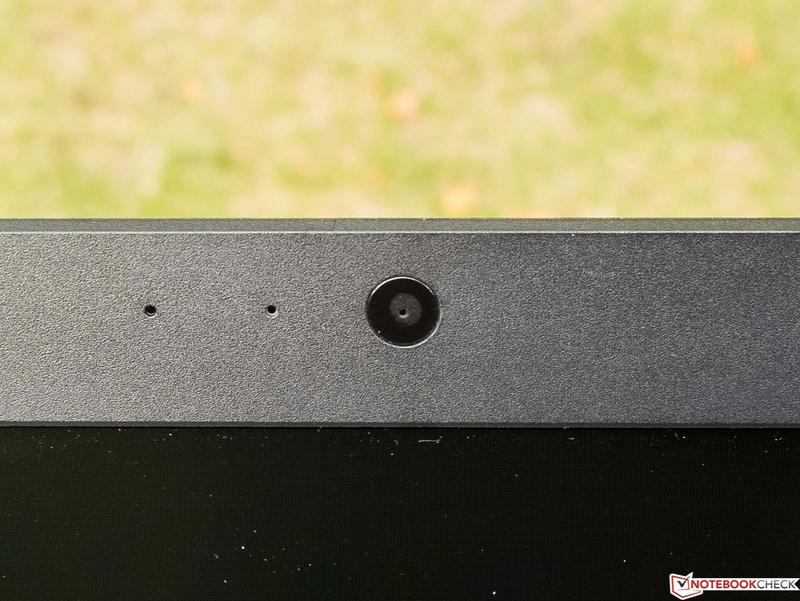 The only visual highlights are set by the set-piece lowered area over the entire width where the keyboard and the speaker grille are housed under the screen. The wrist rest and lid both feature a dotted texture that makes fingerprints tolerable. The areas beside and above the keyboard, screen frame and the base are made of simple, matte plastic that is slightly textured. The case can only be warped with high force, and does not produce any noise. It is not possible to open the lid with only one hand. We did not notice any manufacturing flaws. 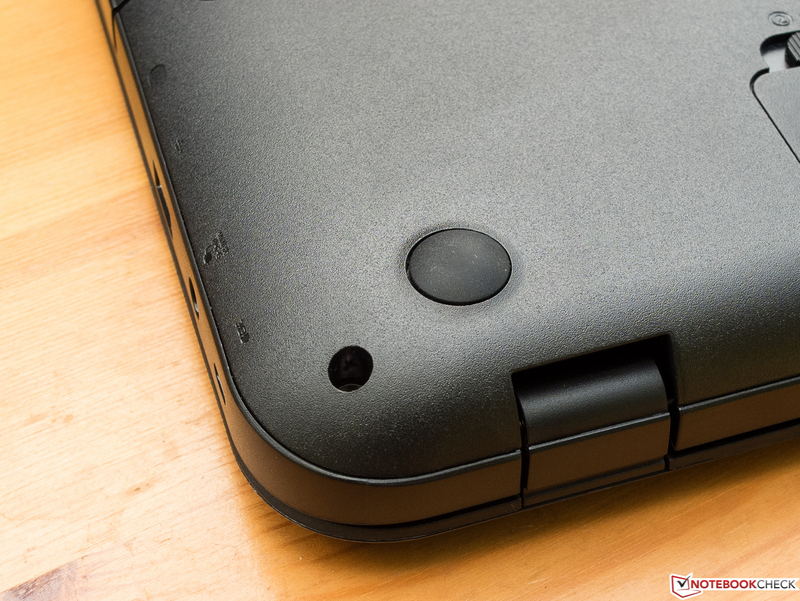 However, in our opinion, the area around the touchpad yields a bit too easily, and gives a somewhat cheap impression. As expected in this price range, the connectivity does not go beyond the bare minimum. At least there are two USB 3.0 ports. 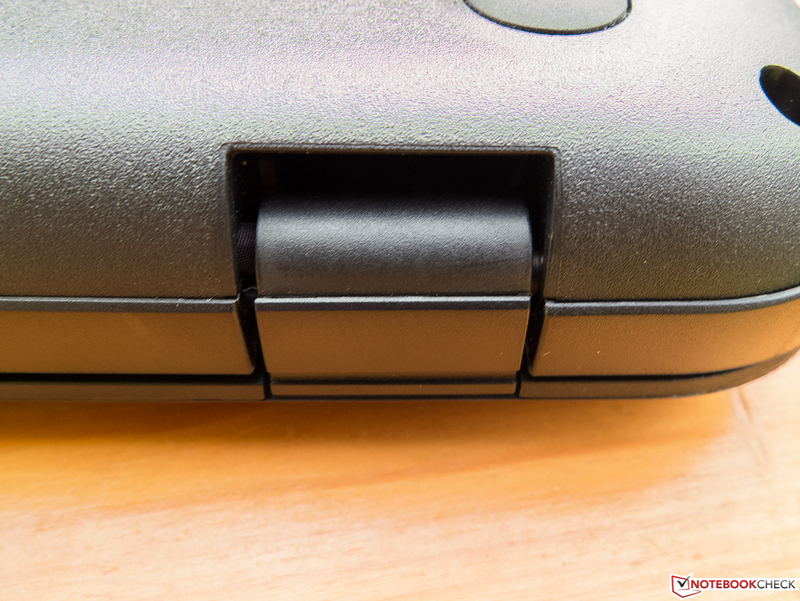 They are placed on the right in front of the vent where most ports are located, that may result in a lack of work space due to disturbing cables or peripherals when, for example, using an external mouse. Power, a USB 2.0, and the Kensington slot are well positioned behind the DVD burner. 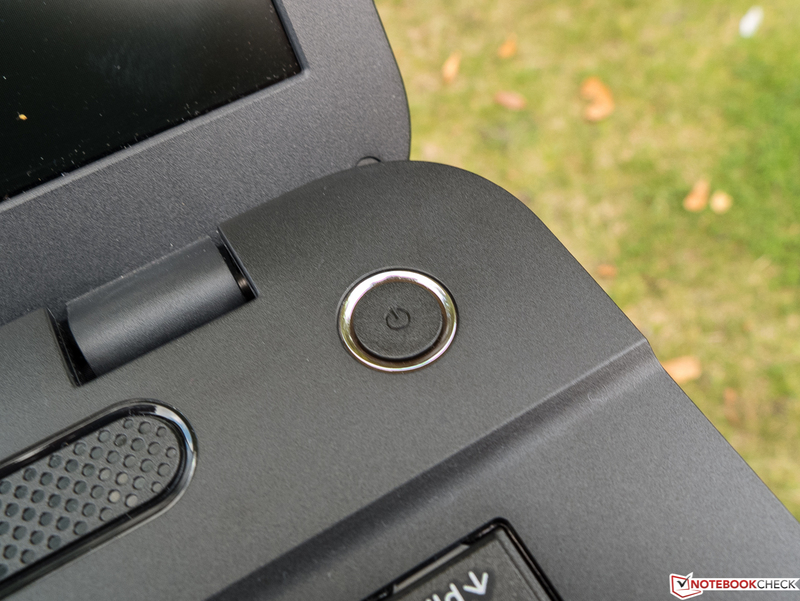 The SD card slot and the highly visible status LEDs, are positioned on the front right. The installed Broadcom BCM43142 Wi-Fi chip is fairly weak, and the author noticed a below average reception performance in his personal test setup. It neither supports the IEEE 802.11 ac Wi-Fi standard ("Gigabit Wi-Fi") nor the less crowded 5 GHz band. The basic standard Wi-Fi Direct and Bluetooth 4.0 + LE, are installed. The data rate decreased sooner and more evidently than in most other tested laptops when gradually moving downstairs away from the router. Users who struggle with serious reception issues to start with, should look at another device or replace the module when necessary. 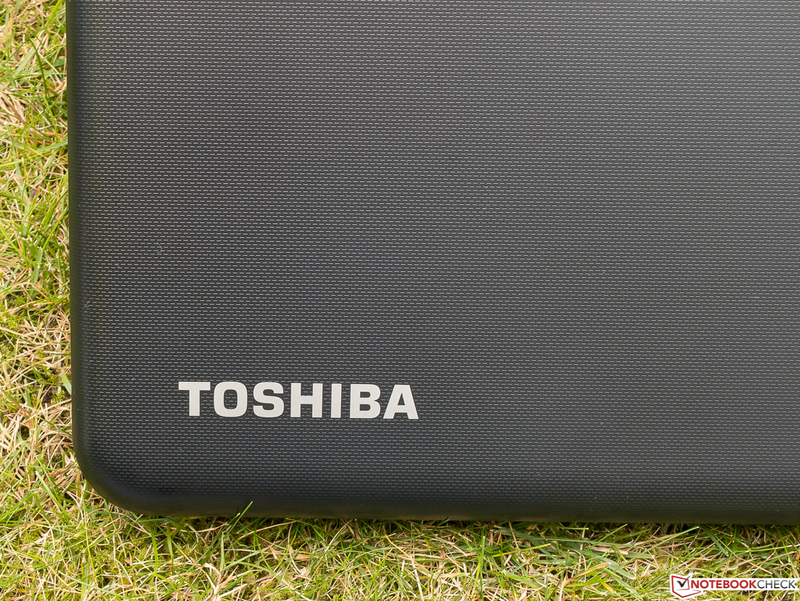 The only accessories worth mentioning besides small items, such as bags, are matching replacement batteries directly from Toshiba. In addition to the power supply, there are safety and warranty notes, a quick start guide, and two installation DVDs for Windows 8.1 in the box. The battery can be replaced. To perform any other maintenance, a number of screws have to be removed and the base's underside lifted off. This should actually be possible without problems, but it may have an adverse effect on the warranty and guarantee. Toshiba includes a one-year European bring-in manufacturer warranty including onsite pick-up service in Germany and Austria when the repair is registered via Toshiba's notebook hotline. In addition, the manufacturer has different warranty upgrades and extensions in its portfolio that can be viewed here. The keyboard's layout alongside the dedicated number pad is convincing. The 102 adjacent, level and roughened keys are mostly where they are expected to be in a standard desktop keyboard. 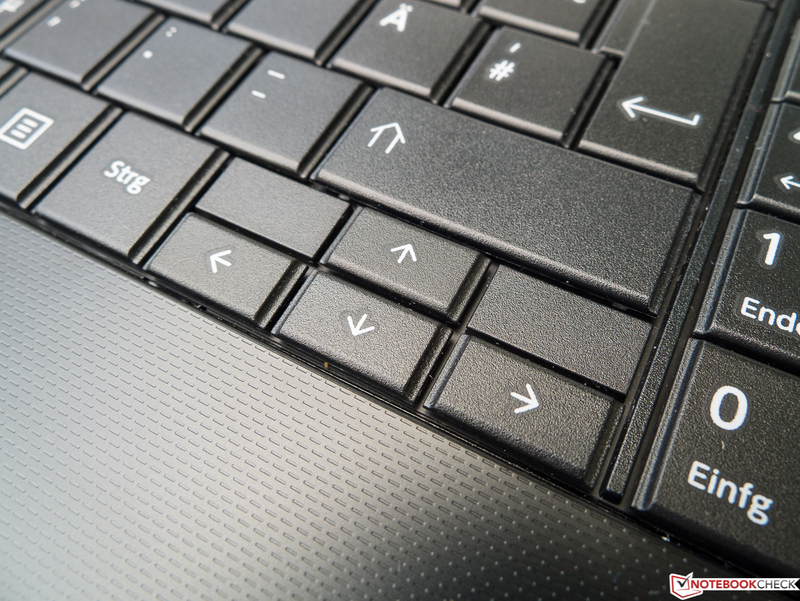 Important keys, such as CRTL or shift, are larger but the cursor keys are only half the size. The stroke is average for a laptop of this size and we would describe the pressure point as a bit too soft. 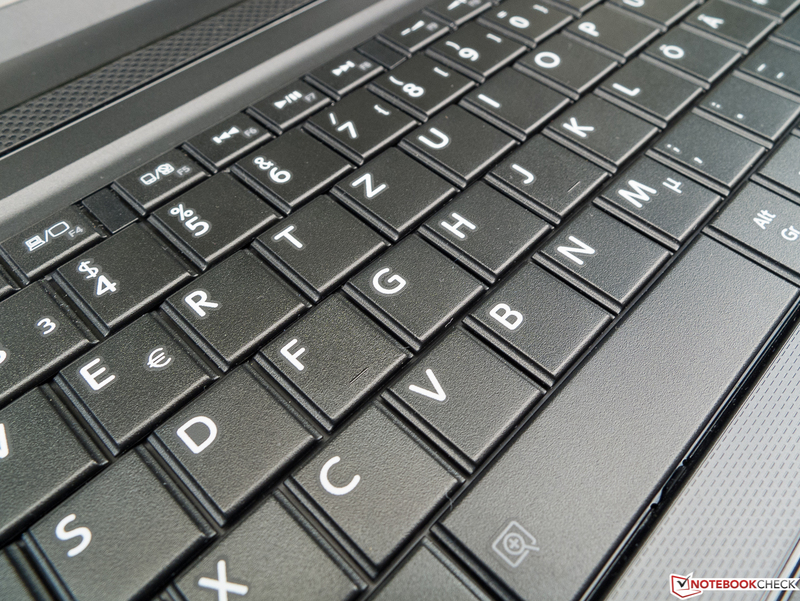 The fact that the keyboard yields under minimum pressure, in particular around the L-key, affects the typing quality and the overall impression. Also a shortcoming: The FN-keys, which are only accessible as a secondary assignment, have a tiny, low-contrast lettering that can only be recognized in good light (there is no backlight). Toshiba forgot the visual on screen feedback for the volume keys. 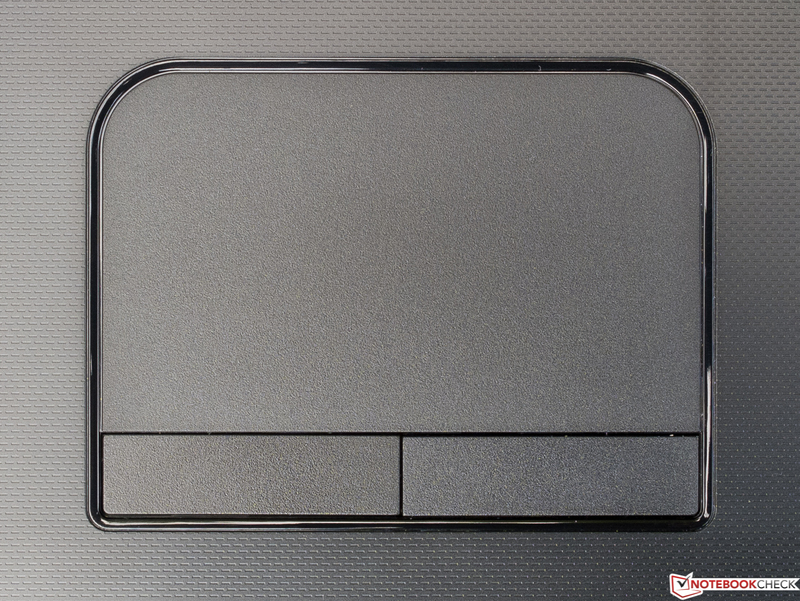 It is too bad that the classic touchpad is not a bit larger; there would have been enough room. There is a few millimeters wide area at the outermost edge that does not respond to touch. The surface is slightly roughened, and provides a good response when gliding over it. We did not observe any lags, and the accuracy and responsiveness did not give reason for complaint. The squeaky keys that should preferably be pressed only in the center, give a cheap impression. Overall, they can be used fairly confidently owing to their pleasant resistance, and good audible response. Up to three simultaneous touches are recognized; the Synaptic driver provides multiple, well-documented configuration options. 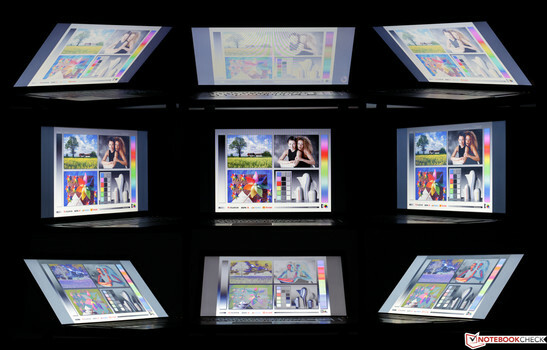 1600x900 pixels distributed over 17.3 inches equals to a not quite standard pixel density of 106 ppi. The matte screen is based on the low-cost TN technology that results in a few drawbacks. Both the maximum brightness of approximately 250 cd/m² and illumination of 84% are average. Subjectively, a black screen looks homogeneous; there is no sign of clouding or even screen bleeding. The screen in Acer's Aspire E1-772 is considerably brighter, and often has the lead among our three comparison devices. 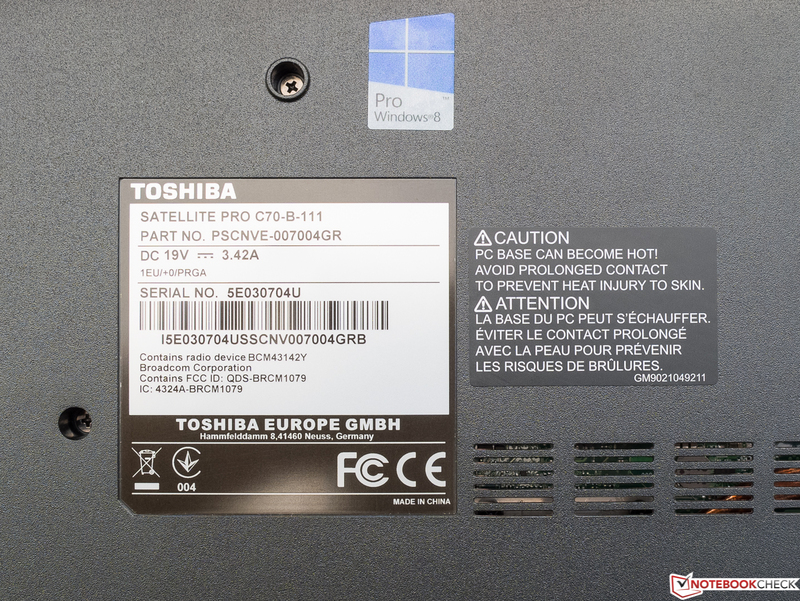 The black level of 0.66 cd/m² of Toshiba's Satellite Pro C70-B-111 is too high. 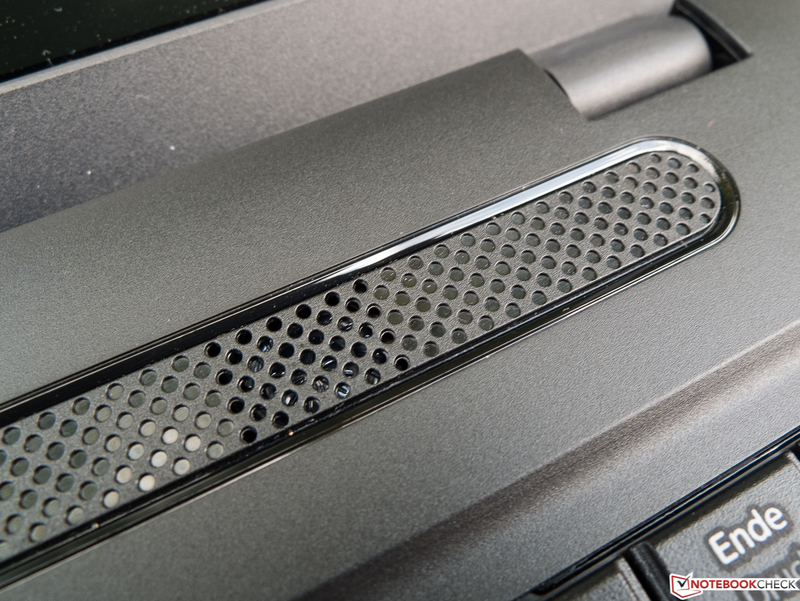 Acer's Aspire achieves a satisfactory rate of 0.44 cd/m². We cannot say that black is very saturated either. The contrast of just 376:1, resulting from the black level and maximum brightness, is also very modest. Again, Acer's laptop stands out from both competitors with a decent 757:1. None of the three devices can boast of their color accuracy. The far too high DeltaE rate of 10 once again leads to a heavy bluish cast that however disappears after calibration. It is remarkable how remote Acer's device is from the gamma rate in contrast to our Toshiba that almost hits the ideal of Windows index of 2.2 with 2.18. Finally, we look at the color space coverage, where TN screens more often than not, only achieve 40% of the large, mainly relevant for professionals, Adobe RGB color space. Toshiba's and Acer's laptop do a particularly good job with over 50%, and thus accomplish very good ratios for a TN screen. 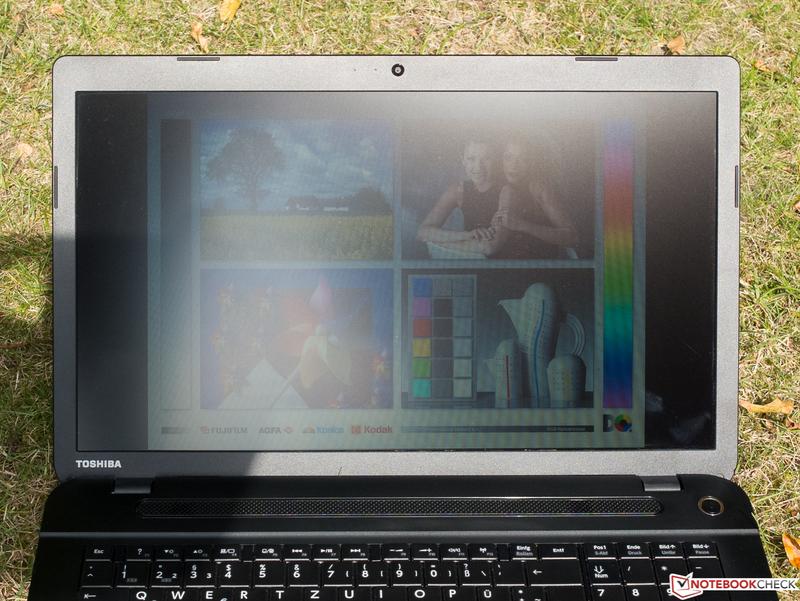 Owing to the matte and not too dark screen, the review sample can be used very well outdoors. It is not difficult to find a position for ergonomic working, even on a sunny day. The screen's viewing angle stability is extremely modest. Although restrictions in this field are normal for TN screens, the manufacturers have achieved significant improvements in the past few years. Unlike many competitors, our Toshiba regrettably does not benefit from these advancements. Brightness and contrast losses are seen earlier than usual when the viewing angle is shifted horizontally. The color reproduction does not suffer much though. The milky impression when looking from above and the inverted image effect from below set in so early, that the user will feel the need to readjust the screen even after the slightest posture change. 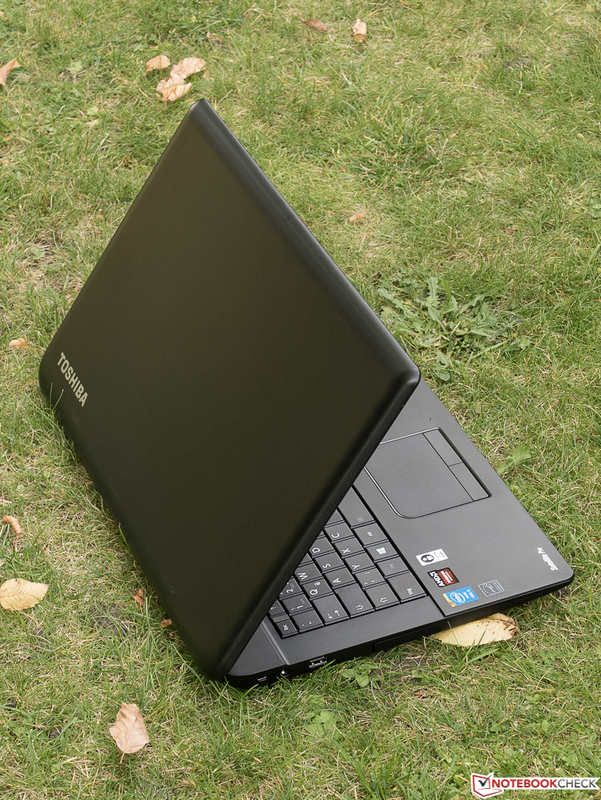 Toshiba's targeted application field for the C70-B-111 as a stationary business laptop should not be a problem for the Intel Core i5-4200U (2x 1.6 - 2.6 GHz; TDP: 15 W), which is supported by a more than sufficient 8 GB of RAM. It even has enough reserves for more demanding tasks, such as complex image editing in Photoshop or games. Then there is the dedicated, lower-range AMD Radeon R7 M260 graphics card with a 2 GB GDDR3 RAM. Everyone should find something among the configurations that we mentioned in the intro, as long as they do not expect a genuine gaming machine, or a professional device for 3D rendering for 750 Euros (~$972). 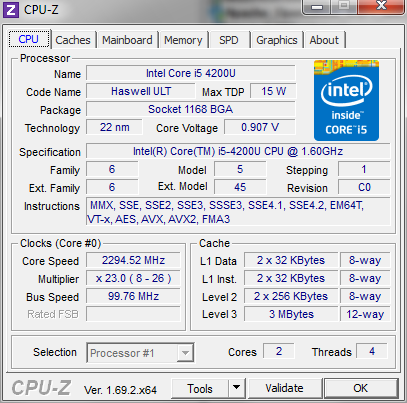 The Intel Core i5-4200U (2x 1.6 - 2.6 GHz; Hyperthreading; TDP: 15 W) is an energy efficient and very popular ULV member of the latest Haswell generation. 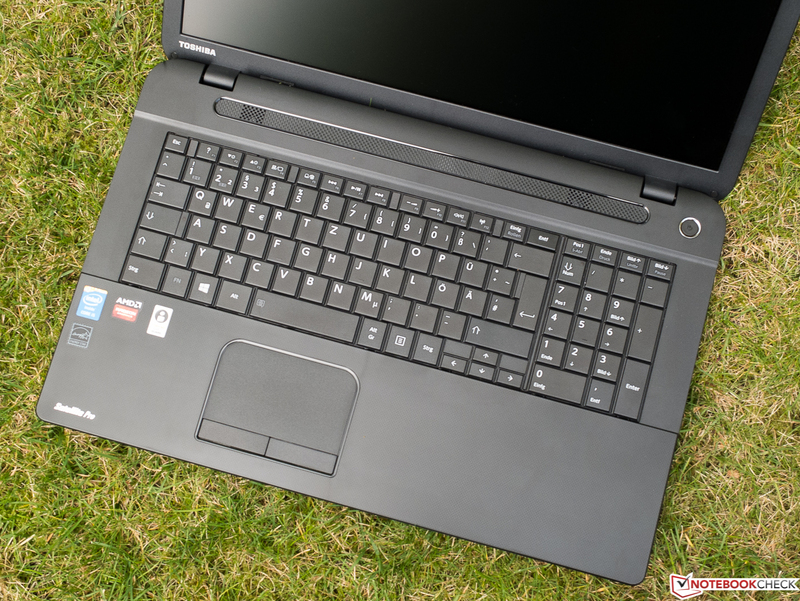 Its performance and other key features make it appropriate as an all-around CPU for smaller laptops and ultrabooks starting with an 11-inch size. 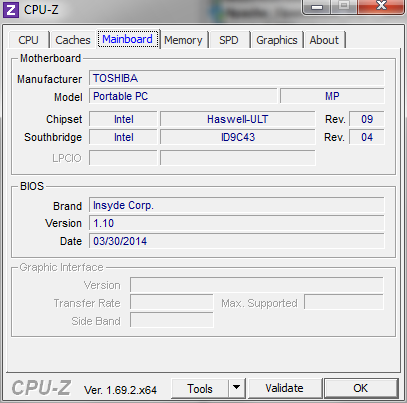 The CPU copes easily with common office software and multimedia applications. However, well-parallelized, recent games are limited by the installed graphics card and not the processor installed in the tested notebook. The Cinebench R11.5 scores are exactly at the expected level. 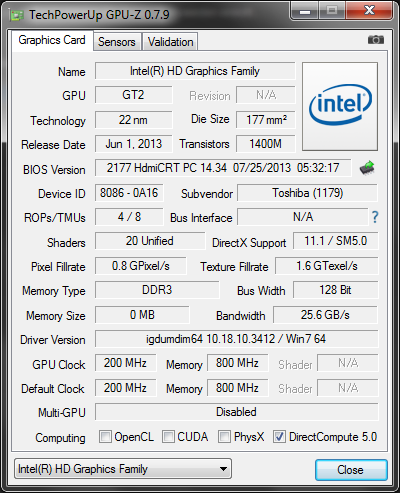 As expected, both i5-4200M CPUs (2x 2.5 - 3.1 GHz; Hyperthreading; TDP: 37 W) have a quite clear edge on the i5-4200U. It does not mean that the CPU's minimum performance is 100% in AC mode (default setting) when the high-performance mode is selected. We reduced the rate to 5%, which did not stop the processor from permanently operating with at least 2.3 GHz. The manufacturer has probably blundered here. This phenomenon did not occur in the other energy-saving modes. 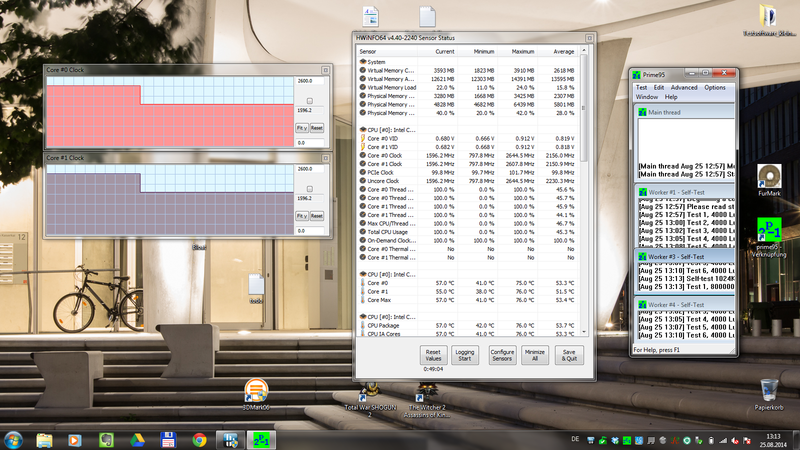 Apart from that, the Turbo utilization worked perfectly under real-life conditions. 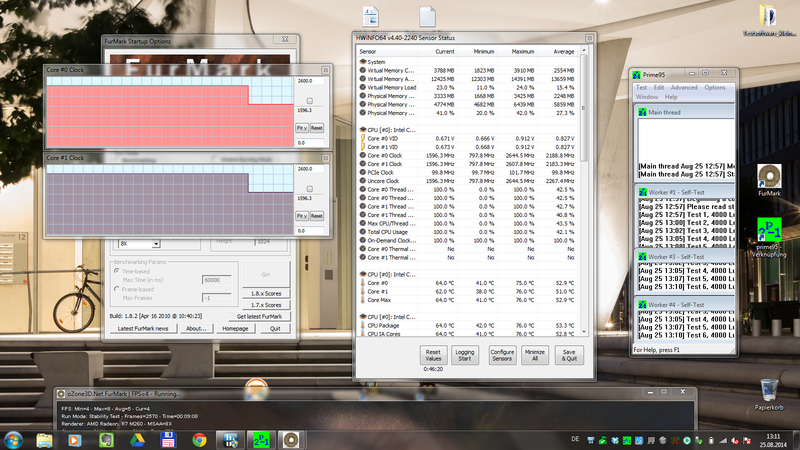 Both cores consistently achieved the maximum clock of 2.3 GHz when Cinebench R11.5 loaded both cores. The single-core Turbo of 2.6 GHz was only occasionally reached during low usage. 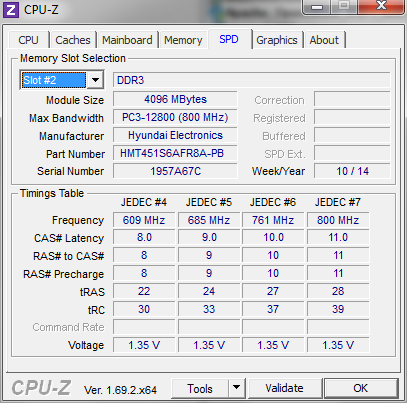 The laptop did not exceed its base clock of 1.6 GHz when the power supply was disconnected. The faster processor only beats the other two competitors to a certain extent in the system performance test, where the storage device and graphics solution are relevant besides the pure CPU performance. The advantage is most distinct in the computing-intensive Productivity benchmark of PCMark 7, but it does not exceed 13% in the other tests, which is not likely to be noticed in practical use. Subjectively, routine work was mostly smooth, although, occasionally lags were observed, obviously related to the conventional hard drive. Some money, a screwdriver and the installation of an SSD, can solve this “problem”. 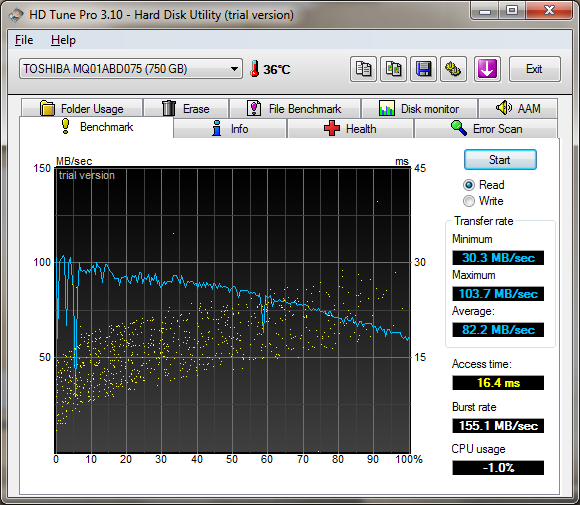 It is unquestionably the hard drive that is the weakest link in the chain in terms of performance. Unfortunately, we cannot give the Toshiba MQ01ABD075 (750 GB, 5400 rpm) a good grade when compared with other, modern HDDs. Only 86 MB/s in sequential read is no longer adequate. 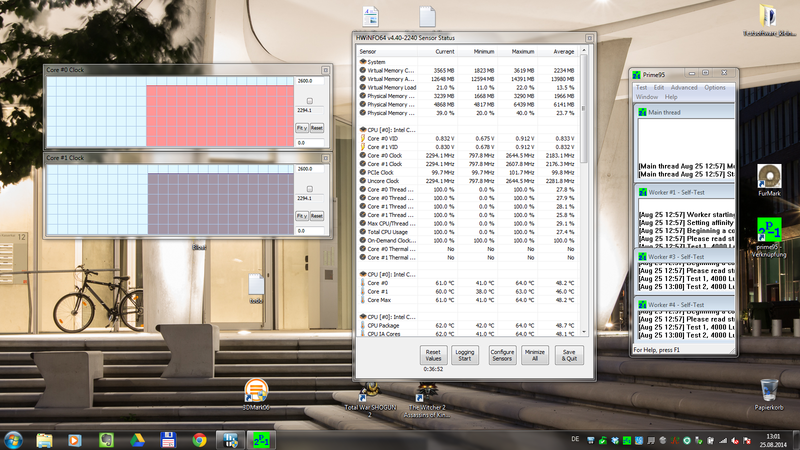 The average is over 100 MB/s here, achieved by the same drive in HP's Pavilion 17-e126sg as well as both comparison laptops. 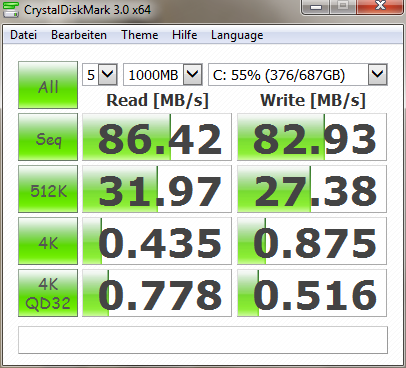 We can confirm that the drive does a better job with reading small, random data blocks (4k). The achieved rate is just above the average of comparable HDDs. The single test 4K QD32 Read involves reading exactly those small data blocks with multiple simultaneous tasks, which is to simulate loading programs and booting the operating system. The accomplished 0.78 MB/s are again 16% below the average here. Acer's Aspire E1-772G and HP's ProBook 470 take a lead of 45%, and 14% respectively in this exercise, which can be noticeable in practical use. 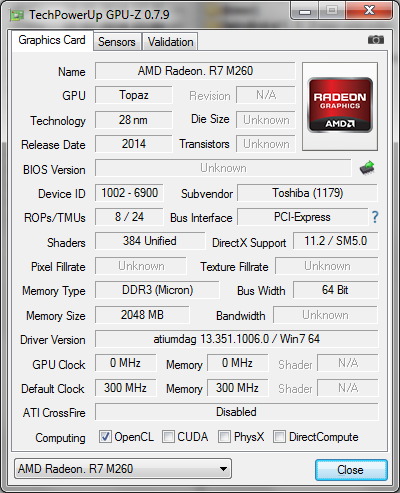 An AMD Radeon R7 M260 graphics card with a memory interface of only 64-bits is installed in our review sample. 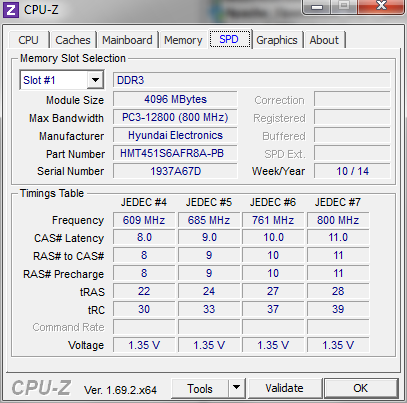 It clocks 980 MHz while the somewhat faster 128-bit version is limited to 715 MHz. 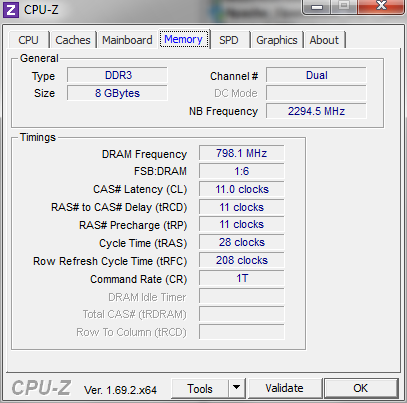 2 GB of GDDR3 RAM and an effective clock of 2 GHz form the dedicated memory. The chip is based on the current GCN architecture, which is very similar to the former Radeon 8600M and 8700M family of GPUs. 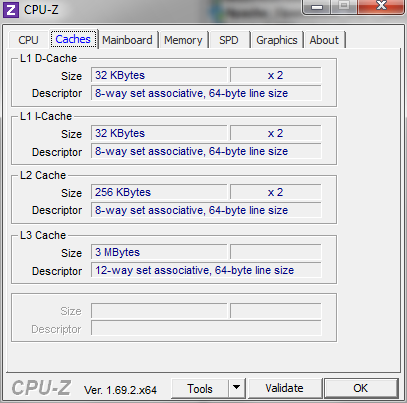 It supports both DirectX 11.2 and Mantle with the Catalyst 14.7 RC3 driver. Owing to AMD's Enduro, the Radeon is automatically enabled during demanding (3D) graphic calculations; otherwise, it leaves the work up to the frugal, on-chip Intel HD 4400 GPU. In terms of performance, the R7 M260 places itself 5 to 7% before the GeForce 825M, 33 to 36% before the 820M, and is exactly on par with the actually faster Radeon R7 M265 (using an older driver), as well as the still very popular GeForce 740M according to 3DMark 11. That might be surprising, but the mixed results of the newer 3DMark (2013) barely confirm this. The single benchmarks Cloud Gate (DX 10) as well as the demanding Fire Strike (DX 11) recorded a significant lead for all mentioned cards except for the GeForce 820M, and so even for the Radeon HD 8750M in HP's ProBook. We ran Cloud Gate in battery mode. The pure graphics score was barely affected, but because of the above-mentioned CPU throttling, it dropped from 4406 (AC mode) to 3703 points. The benchmark chart below this paragraph speaks for itself: The older and/or graphically less demanding the game, the more likely it is to experience smooth gameplay using medium settings in 1366x768. This is true for games with an isometric perspective, such as Anno 2070 or Dota 2, and even tracks like Bioshock Infinite that are based on the relatively modest Unreal Engine 3, can take advantage. Users who value a higher graphic quality or want to play current graphic smashers like Thief or Crysis 3, should avoid the R7 260M, and look around in the performance class of an Nvidia GeForce GTX 860M or higher. Battlefield 4 refused to start no matter which driver we used. Experience shows that it will however run smoothly using at most minimum settings in a resolution of 1024x768 pixels. 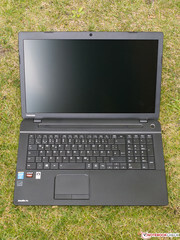 Although the fan in Toshiba'a Satellite Pro C70-B-111 ran during low usage, such as office or browsing, it was hardly distinguishable from the usual ambient noise. 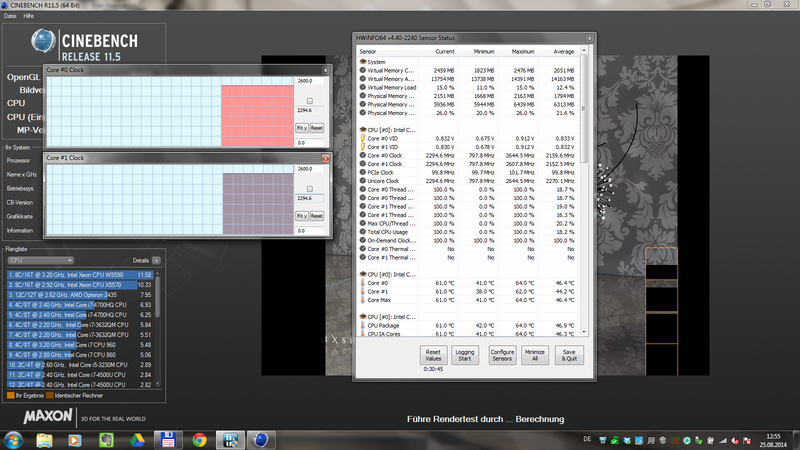 Prime 95 pushed the fan to a higher speed that was a bit too rough for our taste. The device was clearly audible in the fan's third level, but it did not distract the writer at all. The noise level increased even more, when the graphic stress test FurMark was added, and was still audible from a distance of three meters (~10 feet). However, the author still did not find it annoying. 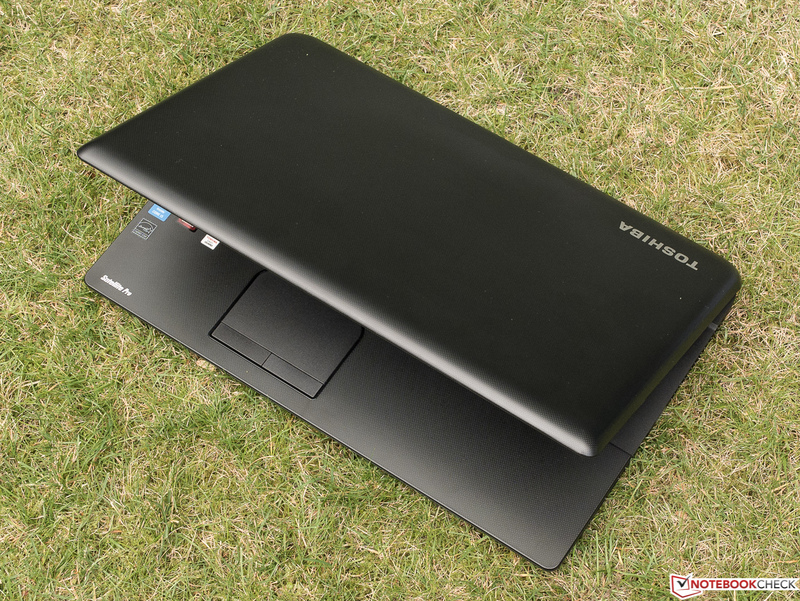 Since the keyboard also produces only moderate noise during typing, we can definitely recommend Toshiba's laptop for use in noise-sensitive surroundings. Both competitors were marginally quieter in the test. The surface temperatures of our review sample are not an issue. Body temperature was only surpassed in one spot even during full load. Both comparison devices reached as much as 47 to 48 °C (116.6 – 118.4 °F) in the same scenario. Using the laptop on the lap is no problem since the waste heat is discharged from the casing's side. The results of our stress test via Prime95 + FurMark were unusual and very satisfactory. As can be seen in the four screenshots under this paragraph, the Turbo utilization functions perfectly even when both cores are put under maximum load. 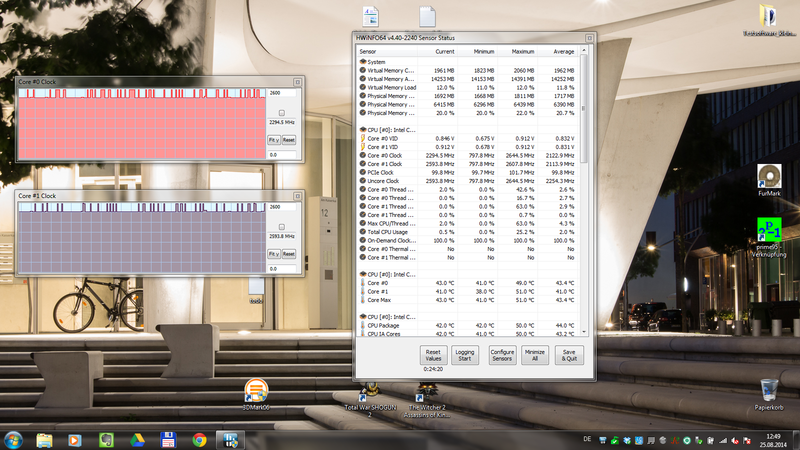 Its 2.3 GHz can be maintained stably even when the graphics card is utilized. 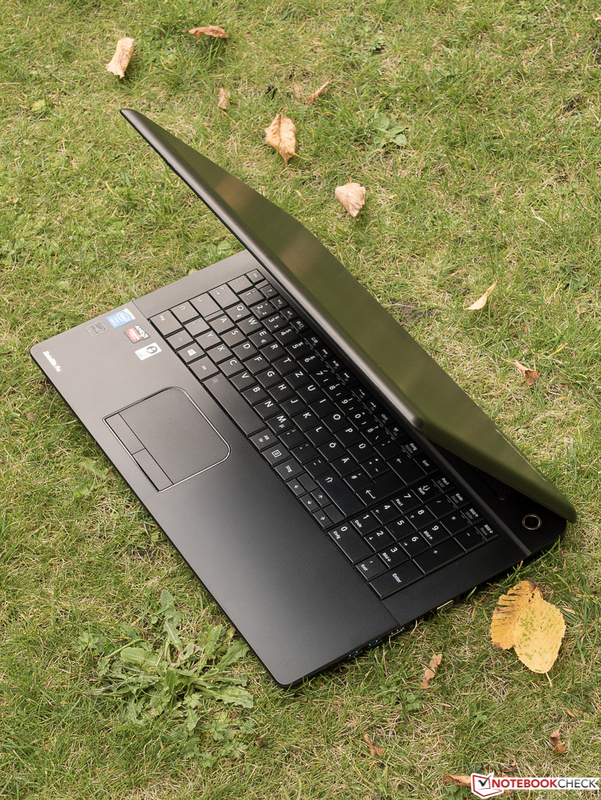 The C70-B-111 is the tester's first laptop that presented such an impeccable performance here. (+) The maximum temperature on the upper side is 34.1 °C / 93 F, compared to the average of 36.5 °C / 98 F, ranging from 21.1 to 71 °C for the class Multimedia. 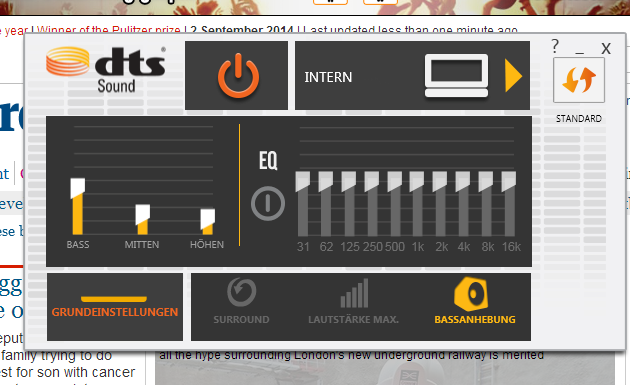 The sound can be changed to some extent, but not improved via the DTS menu. We will deal only briefly with the abysmal "sound" of the C70-B-111 because it is simply not worth it. Despite (or because of?) the DTS logo, the user is faced with a muffled and often piercing sound that is limited to mids and high ranges, and which completely lacks dynamics or surround. Although it does not struggle with volume fluctuations or distortions, it is generally too quiet. Music that involves multiple instruments leads to a muddy sound, vocals sound unnatural, and movie soundtracks of every kind, just like all other media, soon annoyed the tester. Using external speakers will be imperative here. Even the Windows system sound is metallic and hollow. When comparing the review sample's consumption with equally-sized, higher-performance multimedia laptops from the past twelve months, the (avg) consumption while idling is marginal and the full load consumption as much as 23 Watts below the average. For comparison: Acer's Aspire E5-771G-553Q has very similar consumption rates, but also features the much faster Nvidia GeForce GT 840M alongside a comparable CPU. The 65-Watt power supply will not have problems with providing enough power in any situation. 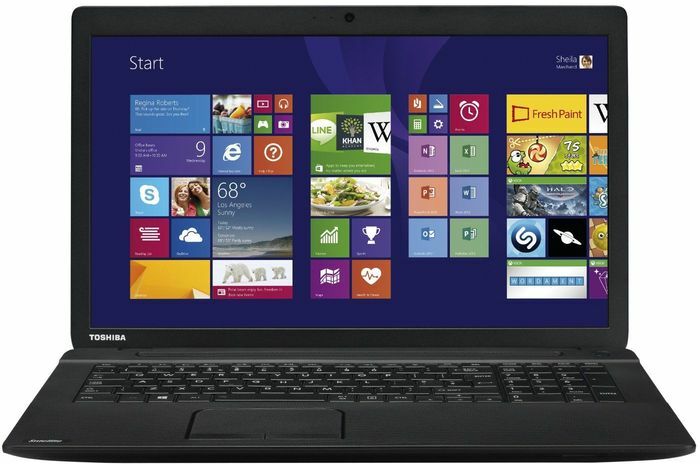 Toshiba's Satellite Pro C70-B-111 is clearly superior to our comparison laptops when it comes to long battery runtimes. This is rare for a desktop replacement. 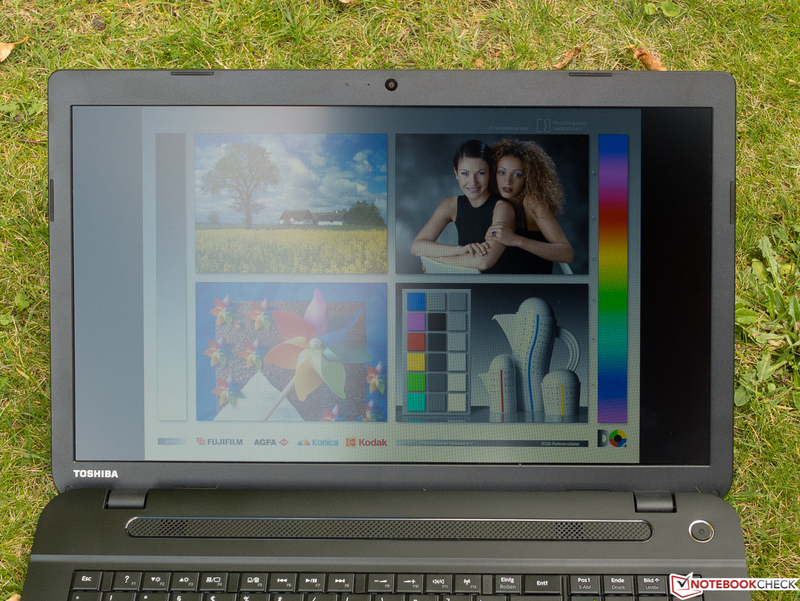 The review sample is always among the four longest running laptops (idle and load: first place) when using the same comparison basis as in power consumption, and even sends models with a considerably stronger battery, packing. One to two hours of gaming is possible, and an outstanding runtime of almost five hours was recorded in the practical Wi-Fi test. 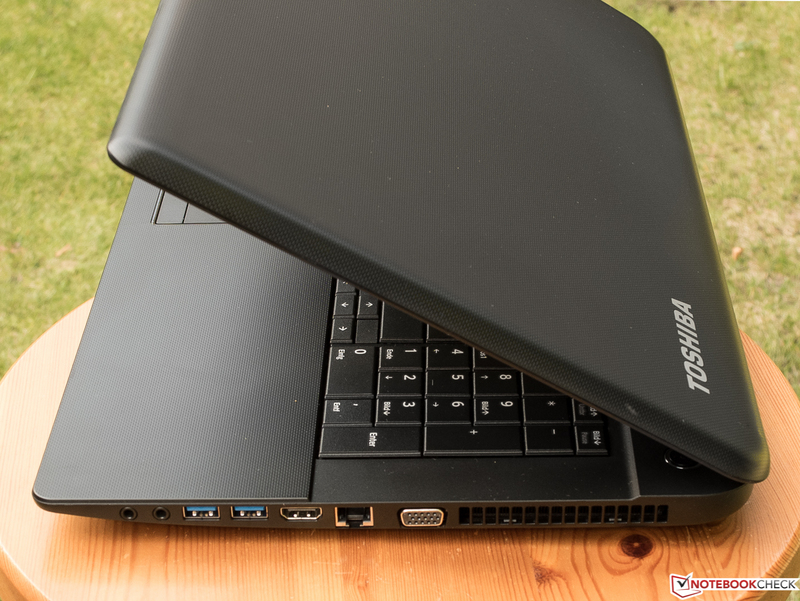 Apart from the relatively bright screen's partly massive shortcomings, the "flexible" keyboard, and far below average sound, Toshiba has created a bundle that made an overall good impression in the test with its Satellite Pro C70-B-111, which we believe is worth its money. As indicated in the intro, the technical aspects like the great Turbo utilization and good thermals that always ensure a cool and audibly unobtrusive operation are particularly impressive. The runtimes were top in all single tests, although it is too bad that they are only secondary for a laptop of this size. The casing is solid, but it is extremely bland and not ideal. The maintenance options are also modest. In terms of performance, the device is quite suitable as a mid-range desktop replacement, which allows taking care of routine tasks perfectly and even risking an occasional game. A hard drive with an accelerating SSD cache would not have hurt the overall subjectively good performance, which should be expected for this price. 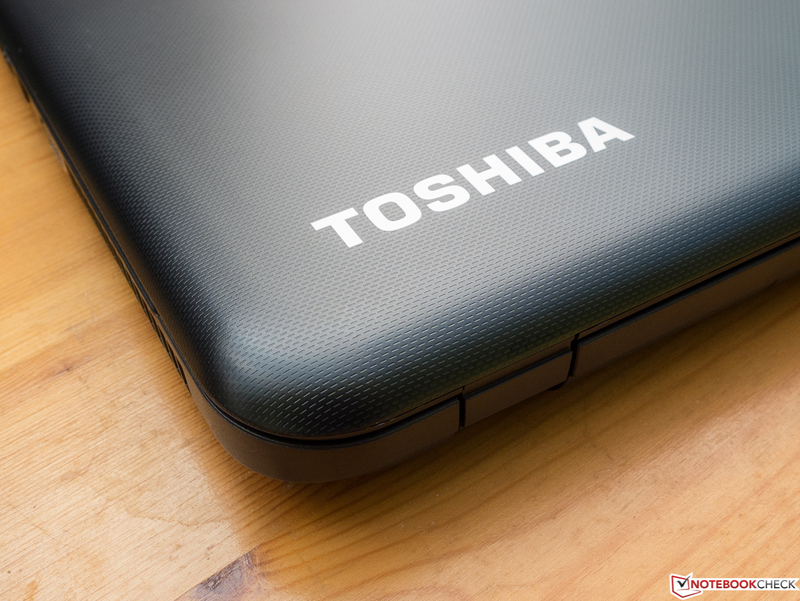 We can give Toshiba's laptop a conditional purchase recommendation since 17.3-inch multimedia laptops are a rather rare thing. 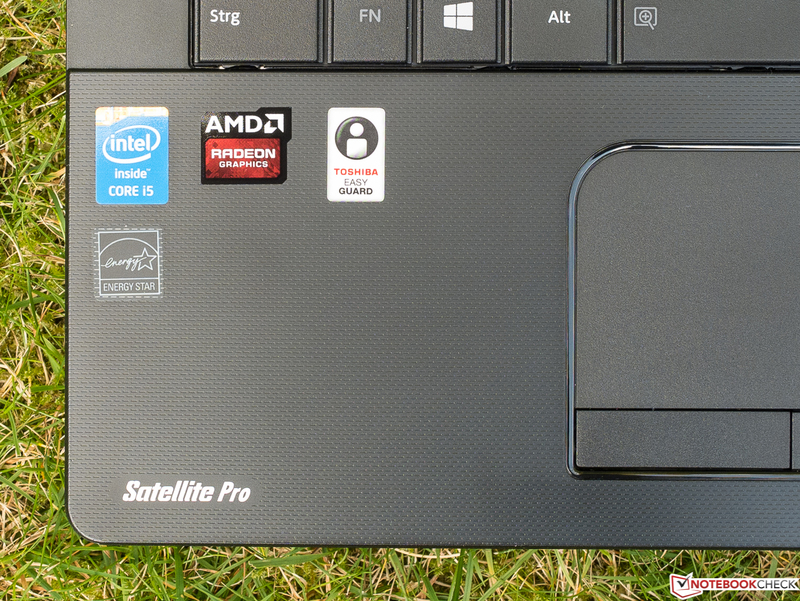 In Review: Toshiba Satellite Pro C70-B-111. 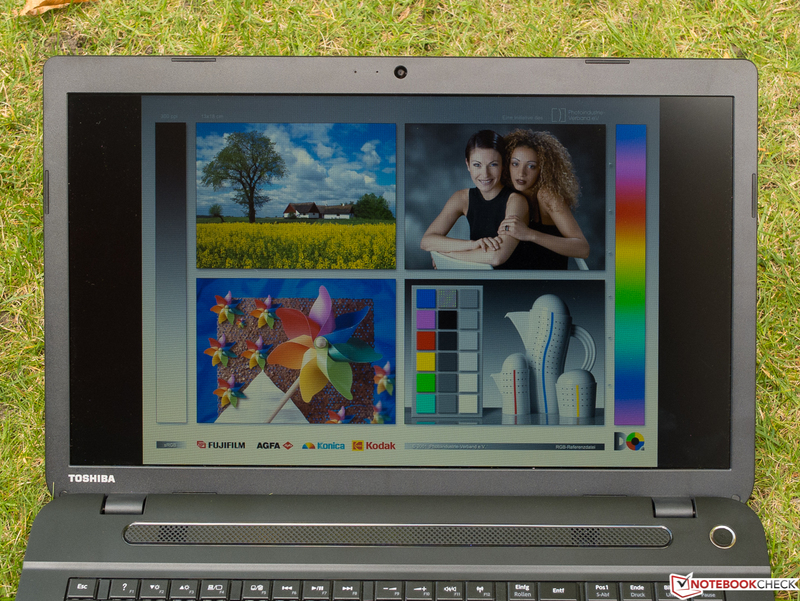 Test model courtesy of Toshiba Germany. ...but has various surface textures. ...and on the base unit's front part. Except for its buttons, the touchpad is satisfactory. 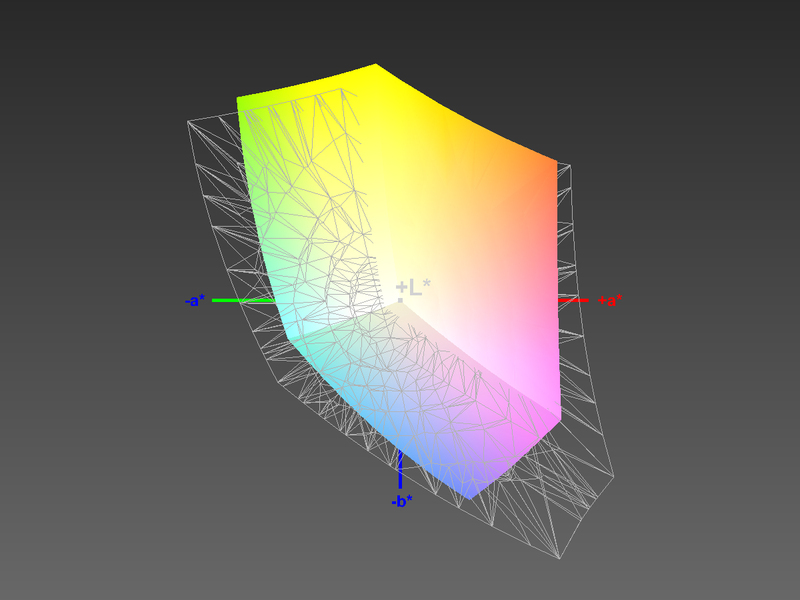 ...a maximum angle of 135°. Unusual: the vent is on the right. The usual stickers are also present. The abysmal speakers are underneath the grille. Rubber stoppers, surface texture, and LED labeling only visible from the underside. 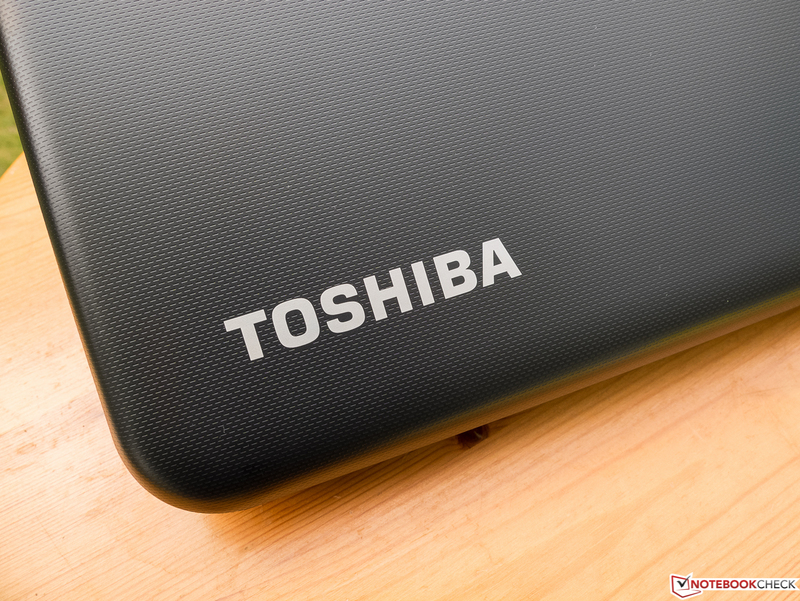 Toshiba extracts the maximum performance from the components. A more rigid keyboard would have been nice, especially in a desktop replacement. Where do these weak TN screens still come from, seeing that equally priced contenders frequently feature superior ones?